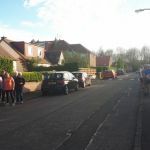 Ewart Scott writes that the fantastic weather made for a very pleasant evening for hashing. The bank holiday (Monday 7th May) enabled more juniors than usual to come along to enjoy the hashing and the social afterwards. Ewart's picture shows the 2 separate groups (running and walking) on different sides of the road. This was because they set off in different directions at the end of the road. Big thanks to Ronnie and Helena Nolan for hosting the hash run. 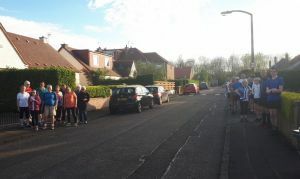 There was a good gathering of folk at the Nolans’ house in Juniper Green at 7 o’clock yesterday evening, in anticipation of the annual Hash run. This year the trails were laid by our President, Ewart, and in his introduction he gave due credit to Ian Jackson who introduced the ESOC Hash to our social programme many years ago. As usual there were two trails, one for the real runners and one for the others (although it should be noted that the slower group did a fair bit of running too!). The twenty-two participants chanced to divide equally between the two groups. Each group had one young member of the Brown family among their number, which was fortunate for the rest of us as Ben and Megan were happy to maintain the checking process when others were flagging. We were also very pleased to welcome some newer members who have not experienced an ESOC Hash before. Several people remarked on how these Hash runs take you to parts of Edinburgh you never knew existed. This year the areas visited included the Water of Leith footpath as well as housing estates and playing fields in Juniper Green and Baberton. The longer trail was laid with white chalk and flour, and the shorter with pink, so at times we could see where the others might be coming or going but we didn’t coincide until we all met up eventually back at the Nolans. It was a lovely warm evening so we were able to spread out on to the garden patio as we enjoyed the social chat and splendid refreshments provided by Helena and Ron. Three more folk who had opted not to run joined us, making twenty-five in all. Very many thanks to Ron and Helena for hosting, and to Ewart for all his planning and careful laying of the trails.